Philadelphia Eagles backup quarterback Nate Sudfeld named Tom Brady as one of his biggest idols growing up. Sudfeld lived like Brady during the season, cooking “TB12”-inspired meals and using the recovery pajamas Brady promotes. 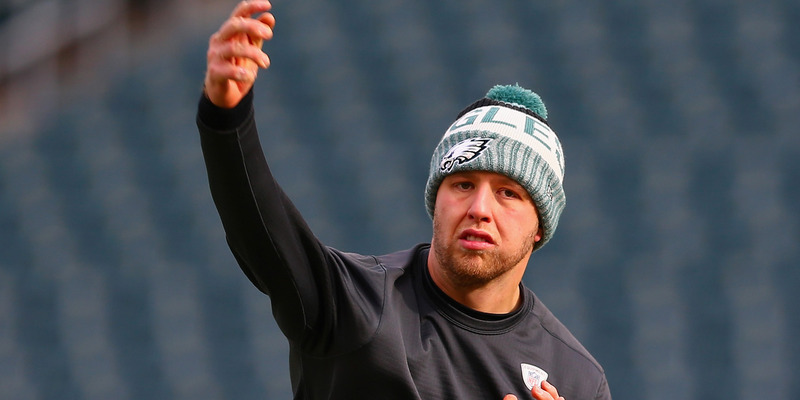 Sudfeld is now the second-string quarterback for the Eagles, and if Nick Foles get injured, Sudfield could get a chance to play against his idol in the Super Bowl. Though Nate Sudfeld was the Philadelphia Eagles’ third-string quarterback most of the 2017 season, he apparently spent his time modelling himself after his team’s Super Bowl opponent. According to Marcus Hayes of Philly.com, Sudfeld has admired Tom Brady for most of his life, and even took to following “The TB12 Method,” Brady’s lifestyle book, during the season. Brady, of course, has a famously strict diet and released a cook book for those trying to emulate him. During the season, Brady promoted pajamas that are supposed to help recovery. They cost $US200 and sheets cost $US350, according to Hayes. There are other similarities between Brady and Sudfeld. Both grew up in California – Brady in San Mateo, Sudfeld in Modesto – went to Big 10 schools (Michigan and Indiana, respectively) and were drafted in the sixth round. According to Hayes, Sudfeld’s brother, Zach, an NFL tight end, played three games with the Patriots in 2013 and relayed information about Brady’s work ethic to Nate. And now, with the Super Bowl approaching on Sunday, the Eagles have Sudfeld playing Brady’s role, acting as a Brady impersonator on the scout team to help the first team prepare for the game. With Carson Wentz’s injury, Sudfeld is now the next man up if Nick Foles gets hurt on Sunday. He told Hayes he would be ready if he had to check in against his idol.